Towns across Arkansas put on their best bling for the holidays. Even as the last vestiges of summer cling well into fall, dozens of towns around the state are planning their 2015 holiday light displays as part of the Arkansas Trail of Holiday Lights, a statewide event that begins around Thanksgiving and continues through the end of the year. Here’s a look at some of the highlights. 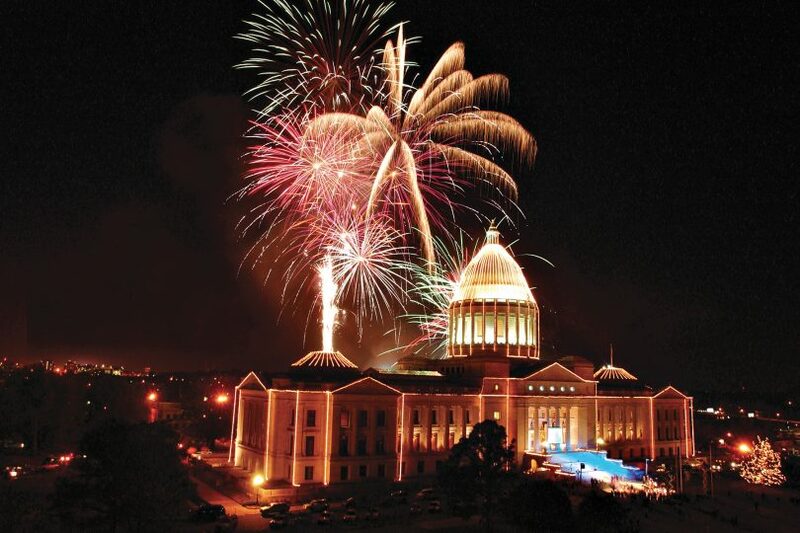 Little Rock’s Big Jingle Jubilee Christmas Parade, set for 3 p.m., Dec. 5, acts as a warm-up for the annual lighting of the Arkansas State Capitol. On the eastern end, downtown’s bridges, lit year-round with LED lights, will be illuminated in holiday colors throughout the season. If indoor lights are more your speed — and temperature — both the Old State House Museum and the Capital Hotel boast Christmas trees worth the time spent finding a parking space. For more information, visit littlerock.com. The city of Sherwood each year transforms its Sherwood Forest recreation complex, at 1111 W. Maryland Ave., into the Sherwood Enchanted Forest. Cars line up for blocks to inch through the 92 displays on the Trail of Holiday Lights. The display lights the nights from the Monday after Thanksgiving through Dec. 30 from 6 to 9 p.m. Admission is free, but donations of nonperishable food items are accepted. To find out more details, log on to cityofsherwood.net. Just a bit south of Little Rock, Benton is home to the Saline County Celebration of Lights. The event includes an annual parade followed by festivities on the Benton town square. Santa makes special visits some nights, so be certain to log on to salinecounty.org for details. Northwest Arkansas is the perfect destination for a holiday-light-themed reprieve. 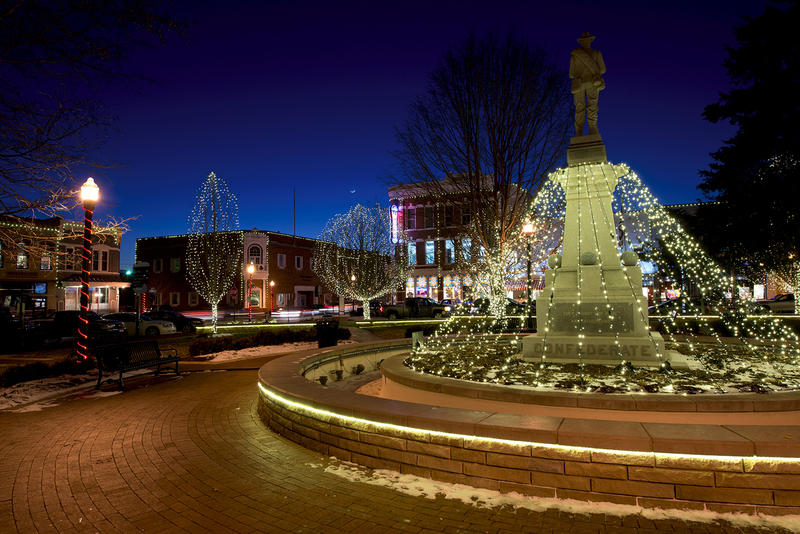 In Fayetteville, the main event is The Lights of the Ozarks festival, which begins Nov. 20, with the Lighting Night Parade at 6 p.m. More than 400,000 lights cover just about every inch of the square. You can also take a carriage ride, visit Santa, sip hot chocolate and apple cider, and listen to area choirs singing holiday music. For a detailed schedule, log on to thelightsoftheozarks.com. 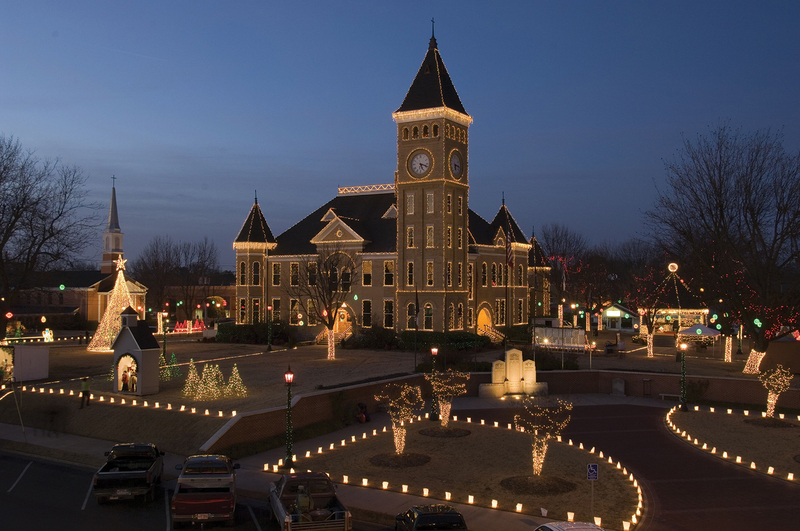 Just up the interstate, Bentonville kicks off its holiday season Nov. 21. You can spend the day shopping at the Winter Market on the downtown square, then grab some hot chocolate and watch the Lighting of the Square at 6 p.m. The lights will stay on daily through December. For more information and a schedule of other special events, log on to their website downtownbentonville.org. 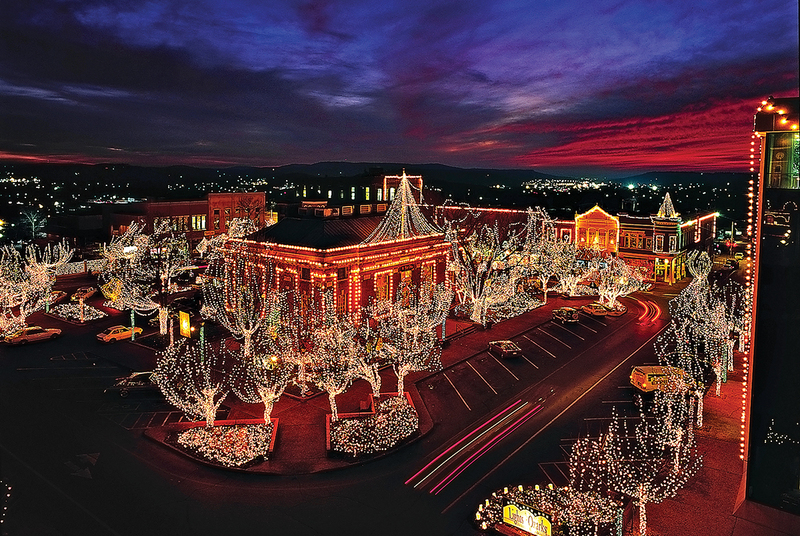 The first weekend in December is always the height of the season in Eureka Springs. The merriment starts with the Annual Silver Tea at the Crescent Hotel on Dec. 3, continues with the Christmas Parade of Lights at 6 p.m., Dec. 4, and finally there’s the yearly Candlelight Tour of Homes Dec. 5, where hosts clad in Victorian garb welcome visitors to some of the town’s most beautifully restored and decorated buildings. You’ll find further information at eurekaspringschamber.com. Mountain View is the place to be if you’re into traditional music. Downtown is always a gathering spot for musicians, and the lighting of the Christmas tree and courthouse on Dec. 5 will be no different. In addition to live music, there is a live nativity and a visit from Santa. If you’re lucky enough to snag tickets, hit Blanchard Springs Caverns for the annual Caroling in the Caverns concerts. For details, visit yourplaceinthemountains.com and blanchardsprings.org/caroling-in-the-caverns. Going by the numbers, it’s probably safe to say nothing in Arkansas tops the Lights of the Delta in Blytheville. Lights of the Delta bills itself as the largest light display in the mid-South, with 6 million lights and more than four dozen animated displays on a 40-acre drive-through site on the former Eaker Air Force Base. Lights of the Delta is open nightly from Nov. 23 through Dec. 27. Admission is $10 per vehicle, with higher prices for buses. 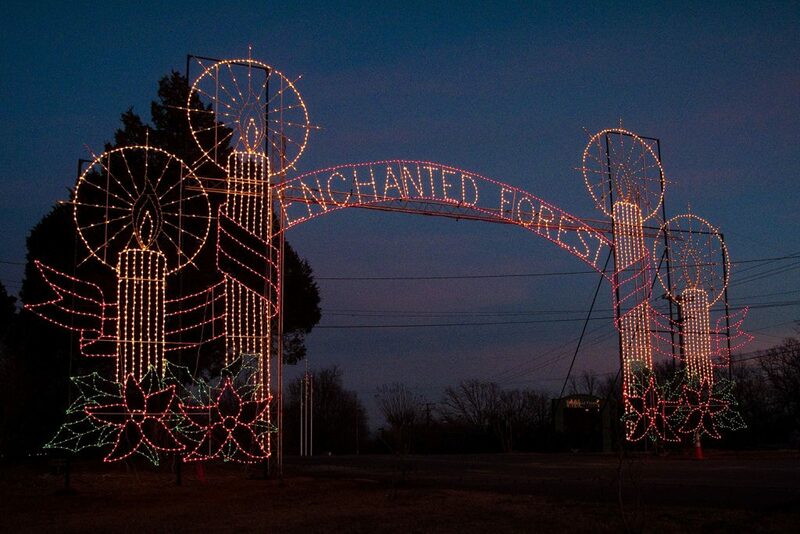 Also advertising itself as the state’s largest drive-through display — you can decide for yourself which one deserves the distinction — is Pine Bluff’s 19th Annual Enchanted Land of Lights and Legends, which boasts 240 displays along a 1.3-mile route through the Pine Bluff/Jefferson County Regional Park. 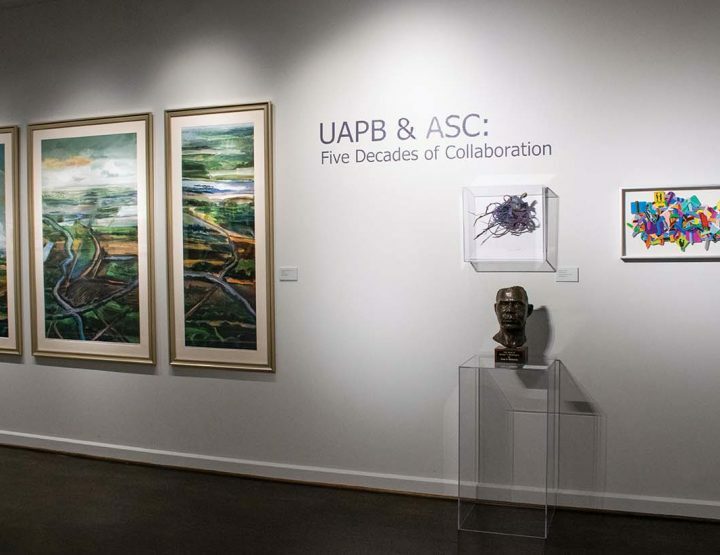 The display is open from 6 to 9 p.m., Nov. 17 through Dec. 31. You’ll find more information at pinebluffcvb.org. 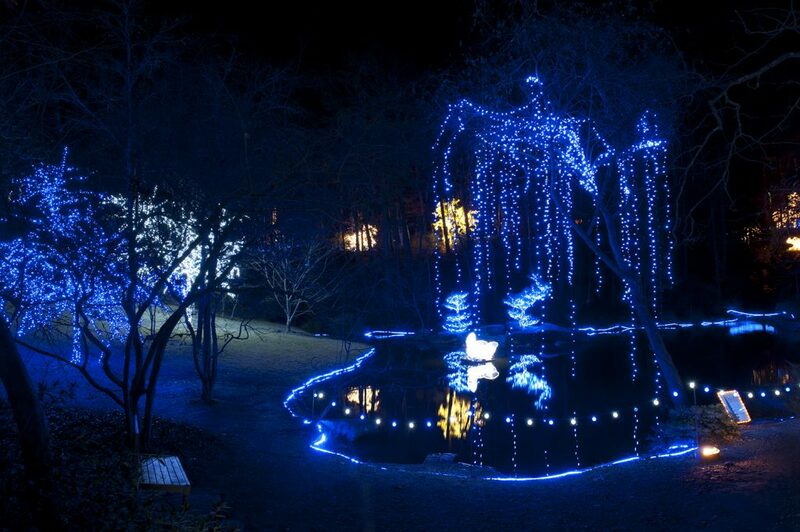 Nature lovers can get their fix at Garvan Woodland Gardens near Hot Springs, where 4.2 million lights “create” flowers, butterflies, leaves, poinsettias, gingerbread people and their signature 50-foot-tall Rose Tree on 17 acres of the garden. This season kicks off Nov. 21 with a concert by the Village Big Band from Hot Springs Village. Other local choirs and music groups will perform on various nights. Santa will also make appearances, along with plenty of hot chocolate. Admission is $15 for adults, $5 for children ages 6 to 12. 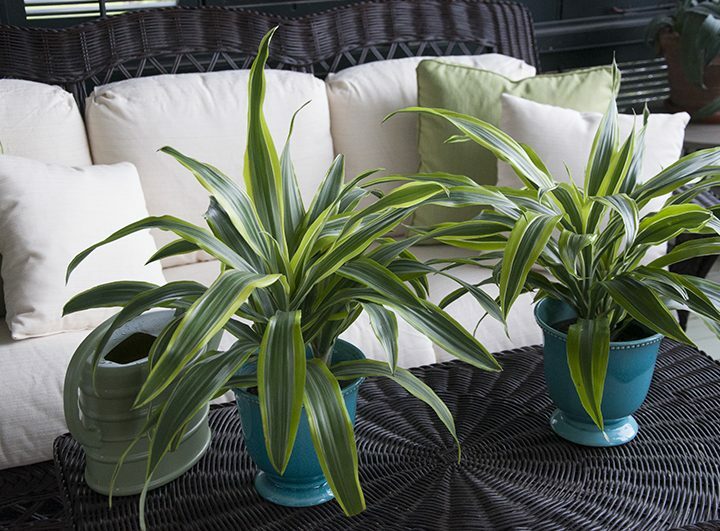 For more information, log on to garvangardens.org. Three miles north of Crossett on state Hwy. 133 you’ll find Christmas Wonderland, a 1 million-light extravaganza that includes a snow machine, laser light show, Snowball Mountain, singing snowmen and a color-changing LED forest of lights. Christmas Wonderland is open Thanksgiving Day through New Year’s Eve. Call (870) 415-1575 for detailed information. In Van Buren, you’ll find one of the most interesting events of the holiday lights season: Living Windows. During this event — scheduled for 5:30 p.m., Dec. 5 — businesses along Main Street create live window displays that celebrate the town’s history. 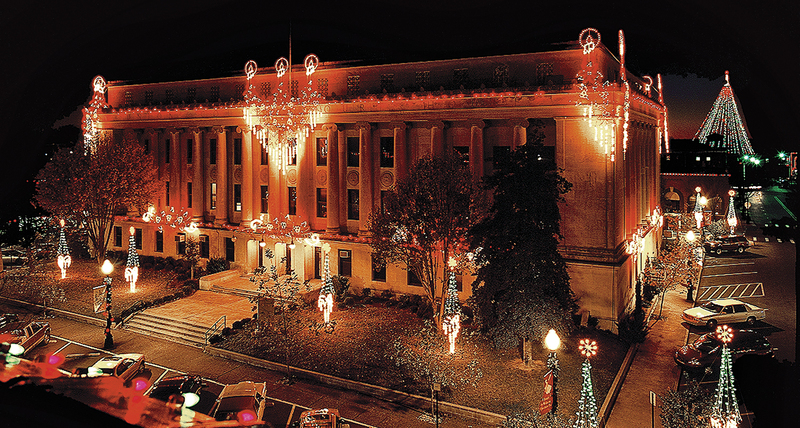 The lighting of the courthouse and the Festival of Trees follow at 6 p.m. For more information, call (800) 332-5889 or log on to vanburen.org. Take a walk through Christmas Past at Historic Washington State Park’s 29th Annual Christmas and Candlelight event Dec. 5 and Dec. 12. The park’s historic village will be decorated with pinecones, grapevines, magnolia and evergreens, and thousands of luminaries will light the streets. Admission is $10 for adults and $5 for children ages 6 to 12. You can find details at historicwashingtonstatepark.com. More than 50,000 lights illuminate the Swiss-style Wiederkehr Village just outside Altus. The village is also home to one of Arkansas’s largest and oldest wineries, as well as the Weinkellar Restaurant, so there’ll be plenty of refreshments to go along with the holiday twinkling. Wiederkehrwines.com is the website for more information. 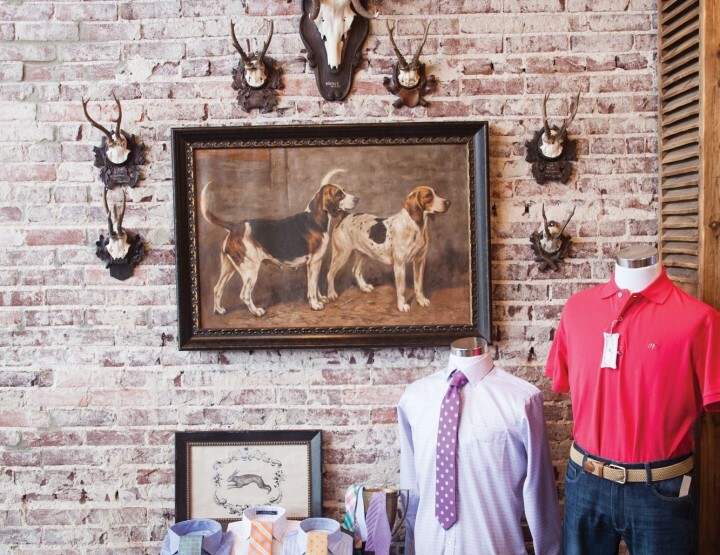 Kick off the holiday season in El Dorado. During the official lighting ceremony Nov.15, starting at 5:30 p.m. at the Union County Courthouse, the kids can hop aboard PJ’s Coffee of New Orleans’ Holiday Express. There will be free horse and carriage rides, a special dance performance from Bravo Dance Studio and special musical guests. Of course, you won’t want to miss the Christmas parade, Dec. 3 at 7 p.m.
No matter where you live, chances are you won’t have to drive far to enjoy beautiful holiday light displays this year. Here’s a list of other towns that participate in the Arkansas Trail of Holiday Lights, grouped by region. Detailed information will be available at a later date, via Facebook — search Arkansas Trail of Holiday Lights — or log on to arkansas.com for dates and times. Happy Holidays! 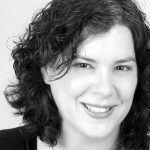 Little Rock native Jennifer Barnett Reed worked for newspapers in Little Rock, Nashville and other cities before expanding into magazine writing, editing and corporate communications as a freelancer. Her work has won awards from the Associated Press, the South Carolina Press Association and the Association of Alternative Newsweeklies.